So, this got practically devoured. Evidently I've needed to read more than I thought I did. This was another book that I got during my work experience with Gollancz and it's been one of the more tempting premises on my shelf. White Cat follows Cassel Sharpe, the only non-magical member of his immediate family, and something of a black sheep. Not only is he not magical, but his family are protecting an awful secret that he can barely comprehend himself. Three years before, he killed his best friend Lila, and to this day he has no memory of the event or why he could possibly do it. As a result, he tries to keep a low profile, become as close to a normal person as he can be by fitting in at school and trying to make something of himself. This is disrupted when he awakens from a dream of a white cat stealing his tongue, only to find that he has been sleepwalking; that he finds this out whilst on the roof of his school's dormitory is particularly alarming. From here, everything he knows is brought into question, and all of it shadowed by the same white cat. I absolutely loved this. 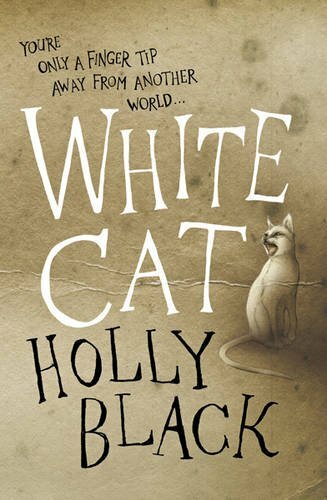 I had read some of Holly Black's work before and, to be honest, not been terribly impressed. I kind of expected something similar to happen here, intriguing premise or not, and for me to have devoured this book within a day is utterly refreshing. So, to the good points. The world-building is fantastic. Set in a version of modern day where magical gifts are illegal in many countries, it actually sets out the consequences of such a society with surprising depth. Because magic is cast through skin contact via the hands, gloves have become common place and to be seen without them is either a huge sign of trust or incredibly threatening. Magic is not without it's consequences, shown in the form of blowback: for example, with an emotion worker, someone who can manipulate other people's opinions and feelings, they have the downside of becoming increasingly emotionally unstable. And the fact that magic has been illegal for generations means that those who want to practice their magic are almost forced into becoming members of a crime family, and the prices that come with that territory are well-explored and really quite awful. The characters are pretty good. Cassel is the one we get to know the most intimately, given that he's the narrator and main protagonist, and to see the emotional rollercoaster that he goes through as a result of others' machinations is utterly heartbreaking at times. Cassel's family get a fair bit of fleshing out as well, but are a little more opaque. Maybe in later installments they'll get more attention, which would be nice. I'd especially like to see more of Desi Sharpe, Cassel's death worker grandfather. The plot was a bit easy to figure out at times, with several of the big twists maybe signposted a bit too clearly; you sort of wonder how Cassel didn't put the pieces together sooner. Despite this, it's still very well written and doesn't really make any wrong steps.